This design is lovely for any occasion. For special significance, you might consider it for a 5th Anniversary gift. Ruby is also the birthstone for July, so it could be a lovely birthday gift, as well. This pendant is actually reversible. On the other side is a melting heart design. 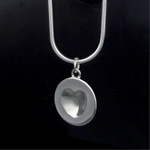 It's 5/8" diameter, and comes with a silver chain. This necklace has a high polish finish and is presented in a wood box. Want more original gift ideas? 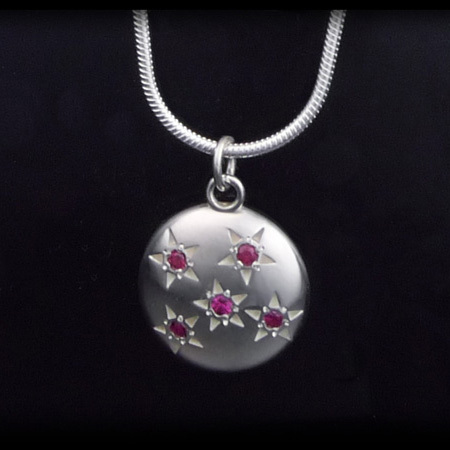 See our full selection of Starry Sky Necklaces, 5th Anniversary Gifts or Birthday Gifts.